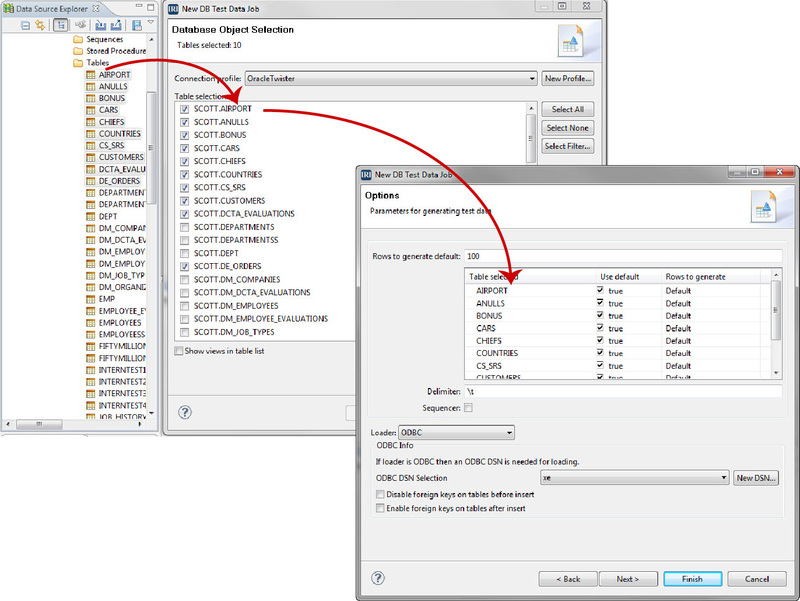 IRI RowGen users can get up to speed quickly from the Welcome screen in the IRI Workbench. First Steps include a getting started "cheat sheet" that links to the RowGen job wizards. Context-sensitive help in the 'DB Test Data Job' and the 'Custom Test Data Job' wizards guide users step-by-step through RowGen job definitions. These dialogs show some of the initial steps in using an existing database structure (which need not contain any data) to generate the right test data. The DB Test Data Wizard allows you to view and parse the DDL information from tables in a current (or empty) database. This structure and relationship information becomes the basis for RowGen Control Language (RCL) jobs that build new, referentially correct test data for bulk-loading the tables automatically.